Adding another user to your Google Analytics account is something that is surprisingly tricky to find if you don’t know where to go. We at Adao* do this on a regular basis, as when we build a new site naturally we set up a new Google Analytics account for it. We then give administrative access to this account to the new website owners. We thought it would be good to record the simple process for others to read in case they were struggling to find how to do this. As a Google Analytics qualified agency, please feel free to contact Adao* if you have any questions at all. 1. 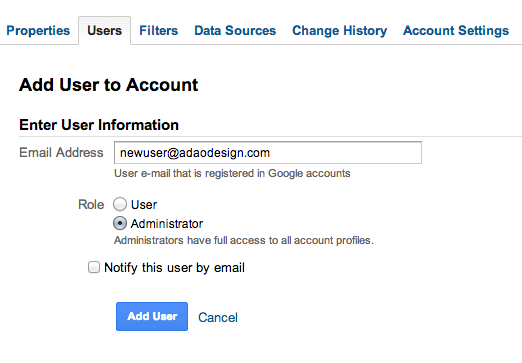 Log into your Google Analytics account and click on “Admin” on the orange bar. These refer to “ADAO” being the account, and “adao.co.uk” being the property. We want to select the account, in order to access the account settings. So in our case, we will click on “ADAO”. 4. Make sure the role selector is selected on “Administrator, enter the email address to give access to, and click “Add User”. Please note that the user will have to be either a Gmail account, otherwise their email will have to be associated with a Google Account.